Homes 4 Families (H4F) hosted its 2nd Celebs4Vets Build at the Veteran Enriched Neighborhood® in Santa Clarita, California on August 25, 2018. The Los Angeles-based nonprofit empowers low-income veterans and their families to enter the middle class by providing them with affordable housing and holistic services that build resiliency, self-sufficiency and economic growth. Over 20 celebrities picked up hammers and paint brushes, and poured concrete, to build homes, including stars from NBC’s This Is Us and Superstore, CBS’ SEAL Team and Young Sheldon and FOX’s Lethal Weapon. Celebs4Vets is a membership-based group comprised of representatives of the entertainment industry who subscribe to the Homes 4 Families mission and lend their support by participating in H4F activities, events and programs. 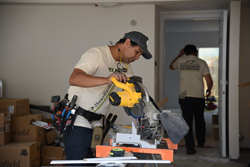 The Celebs4Vets Build provided members with the opportunity to help build some of the remaining 18 of 78 homes for low-income veterans and their families in Santa Clarita, California before H4F moves on to build another 56 veteran homes in Palmdale. Celebrities each rolled up their sleeves to spend the day drywalling and painting the interiors of homes while also calling upon their fans to sponsor their efforts. To donate and support the build for your favorite individual celebrity, please visit https://www.firstgiving.com/event/Homes4families/celebs4vets by September 30th. For more information on Homes 4 Families, please visit http://www.homes4families.org. Homes 4 Families empowers low-income veterans and their families to enter the middle class through affordable, full-equity homeownership and sustainable housing combined with holistic services that build resiliency, self-sufficiency and economic growth. Through its outcome-proven Enriched Neighborhood® model, the nonprofit provides servicemen, servicewomen and their families with comprehensive wraparound services that equip them to succeed in civilian life, including financial education, therapeutic workshops, trauma-informed programs and veteran-to-veteran support. With more than ten years of research-backed experience and success, Homes 4 Families works closely with the California Department of Veterans Affairs (CalVetREN) and others to build permanent, thriving veteran communities.